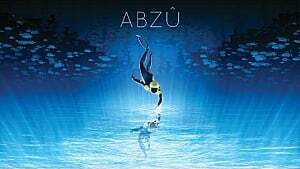 ABZU is a beautiful adventure game that everyone should try. 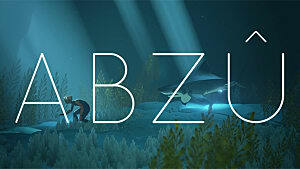 Whether your primary genre is shooters, sports, racing, or anything else, ABZU is a game that can soothe any overly-caffeinated gamer. 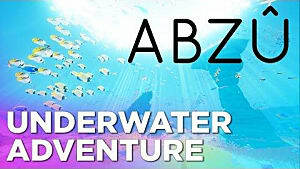 Even though it's not a very long or difficult game, I put together some ABZU tips to help you through the game. I did get stuck several places, so hopefully this article will help you get through those parts a little quicker. First let me start by highlighting some of the controls. The game only shows them to you one time, and (if you're like me) you may forget them. To Dive and Swim, use R2. This is pretty straightforward and you probably won't forget about it, since you will constantly be holding it down for most of the game. To Grab onto a fish, press L2 and hold it. As soon as you let go, you let go of the fish. Keep in mind that it doesn't seem like you can control the fish, but it does give you a boost in speed and lets you get some nice screenshots. To do a little spin move, push the circle button on PS4, or B on the Xbox. This doesn't really seem to be useful for anything, but lets you play around a bit. To interact with something or scan, push the Square button (or X button on Xbox.) This is used throughout the game, so it's probably something else you won't easily forget. Tap the boost button, then wait half a second. Tap it again to get a better boost, then wait another second. Tap again to get a big boost in speed. You can't keep that additional speed by holding down the button, but you can just boost over and over again when crossing a large span of water. Breaching is a lot of fun... and is (again) something I didn't really discover until late in the game. I just didn't even think about trying it earlier on. ...As you can tell, I'm not very good at these kinds of games. Leave me alone. Anyways, the best places to breach are those that have a lot of open area above the water. In other words, those small caves with just a tiny hole to breach the surface aren't ideal. Once you get to one of these areas, swim about 30-40 feet deep into the water. Then point yourself towards the surface and start swimming. When you get about halfway there, use all 3 boosts to get tons of speed to help you really get air! This is especially fun later in the game when you have a certain friend swimming with you. There aren't many collectibles in the game, but there are a few. The first one is a kind of sea shell, as shown above. Most of these are found on the ocean floor. Sea shells can't exactly swim, so that makes sense. There are some areas where the ocean floor is pretty dark though, so searching around down there can be frustrating. Not every sea shell is below you. You get to a point in the game where you can actually climb up out of the water and walk around. There are a few interesting things for you above the surface, so climb up on every area you can. Unfortunately you aren't the fastest walker in the world, but you never have to go a very long distance. I got frustrated and stuck for 30 minutes because I didn't realize I should do this, so don't make my mistake! 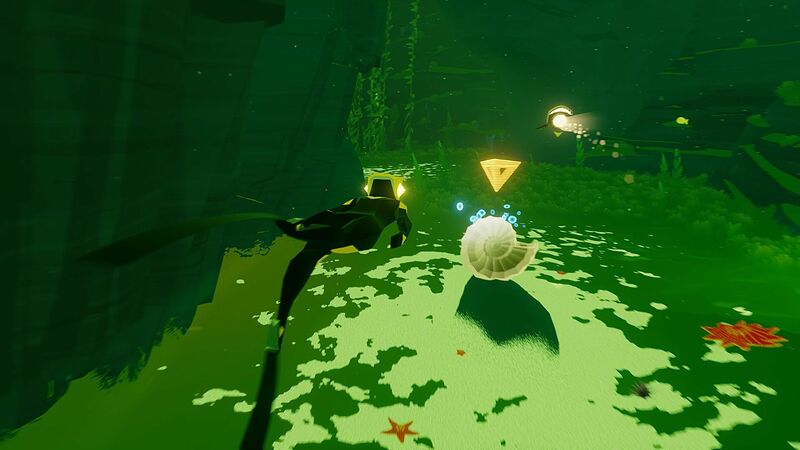 Another collectible besides the sea shells is to release sea creatures back into the environment. This is pretty neat because before you do so, this kind of critter won't be swimming around. But once you interact with their little prison, you'll find them close by, giving you another buddy to swim with. Huzzah! Similar to the sea shells, these are all found on the floor. The good thing is they light up a little bit when you get close, making it a little easier to see them in darker water. Tip #7: Aim for the Fish! 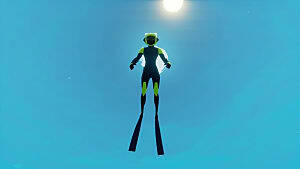 Several areas of the game have you swimming in a jet stream. It reminds me of the scene in Finding Nemo when his dad is swimming with the sea turtles. In ABZU , these areas give you another opportunity to get a little collectible- kind of. You'll see schools of fish in these streams, and you want to aim for them. When you swim through he middle of them, they all flash white. ...I know, maybe not the most exciting thing in the world. 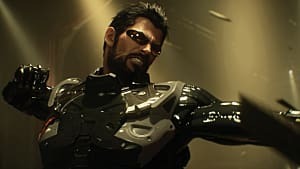 But it does give you something to do while swimming through these areas and this game isn't about getting your adrenaline pumping like Call of Duty. There's one part in ABZU that's pretty intimidating. You'll know what I'm talking about when you get there. I'd throw a picture in here but... it'd be a bit of a spoiler. Keep in mind that you can't die, so don't worry about that. My best tip to get through this area is to swim low. I tried taking the high road at first, but it didn't work out as well as I expected. Of course you don't have to follow my advice, but be prepared to get frustrated if you don't! 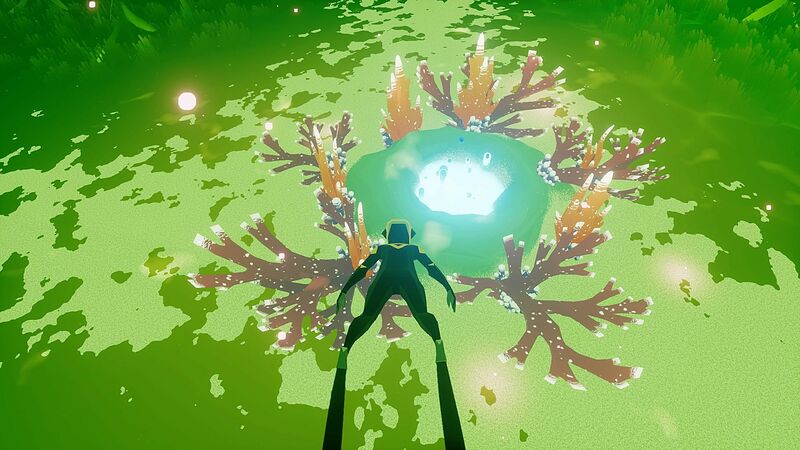 ABZU Tip #9: Where's that Darn Meditation Statue? 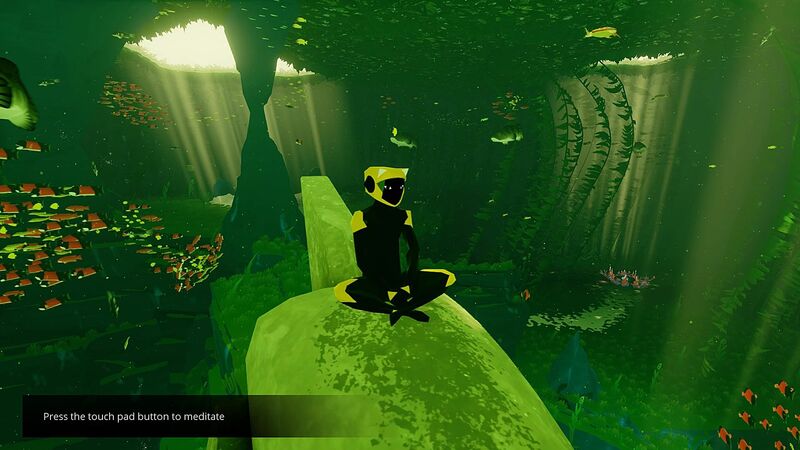 Meditation statues are the final collectible-type thing in the game. They let you perch up there and meditate on the various sea creatures around you. Pretty cool for screenshots and to just give you a chance to enjoy this beautiful game. These statues look like sharks bent at a 90 degree angle. 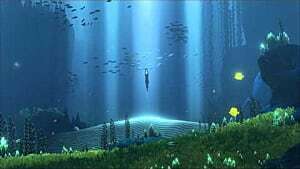 Some are found on the ocean floor, others are on pillars and ruins. The key is to keep your eye out for anything jutting out of the ground or ruins. Unfortunately these aren't always the grey color you'd think a statue might be, as you can see in the picture above. 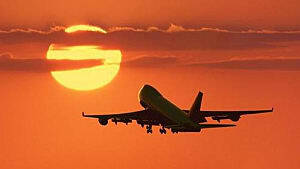 Tip #10: Take Your Time and Enjoy! 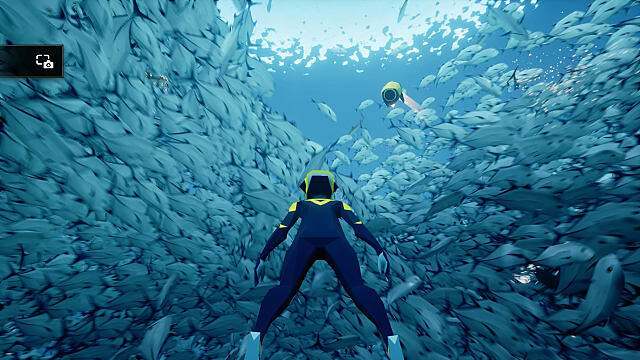 ABZU is a beautiful game, and it's not really about "beating" it. 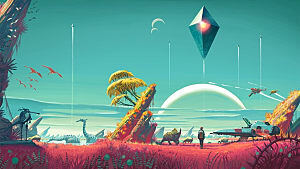 Even though there is a bit of a story and an ending, it's really about just enjoying the beauty of the game and letting you relax a bit. It's also the only game in my library I feel okay letting my 2 year old watch. It's definitely a win-win, as it lets me play a relaxing game and she gets to enjoy watching the fish, turtles, squid and everything else do their thing. You aren't rewarded in most games for doing this (read: you die.) 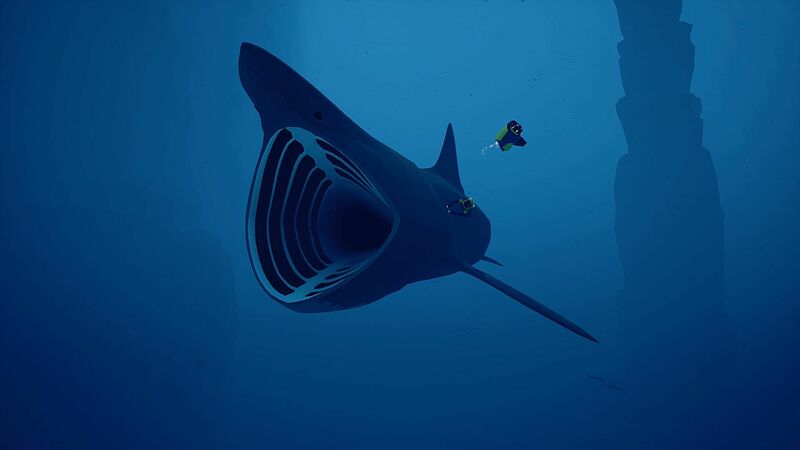 But in ABZU, there are several places where this is the correct (though scary) path ahead. 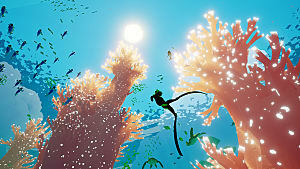 ABZÛ Review: Sure it's Beautiful, But is it Worth Playing?